Shigeo Nagasima, honorary manager for life of Tokyo Yomiuri Giants received “Medal of Friendship of Cuba” at the Cuban Embassy in Tokyo on November 22 for his role to promote ties between Japan and Cuba. ï¬	Worked with Nippon Professional Baseball to play exhibition games between the two national teams before 2004 Athens Olympics. 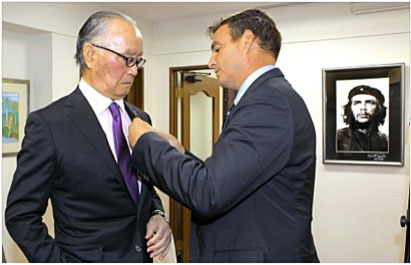 Antonio Castro, 3rd Vice President of IBAF decorated Nagashima with the medal and commented that he found it a great privilege to be able to join the ceremony. Castro toured with Cuban National Team for exhibition games against Samurai Japan comprising WBC candidate players in Fukuoka and Sapporo, and visited Tokyo before returning to Habana. Nagashima thanked for the honor and pledged that he will contribute friendship between Cuba and Japan through baseball.